Are There Green Shoots, or Are There Just Weeds in the Unemployment Data? HomeBusinessAre There Green Shoots, or Are There Just Weeds in the Unemployment Data? In a piece written for the Atlanta Federal Reserve Bank on Monday, Melinda Pitts and Menbere Shiferaw, both economic research analysts at the Atlanta Fed, deal with the question of whether the recent improvements in some of the employment data are really green shoots. 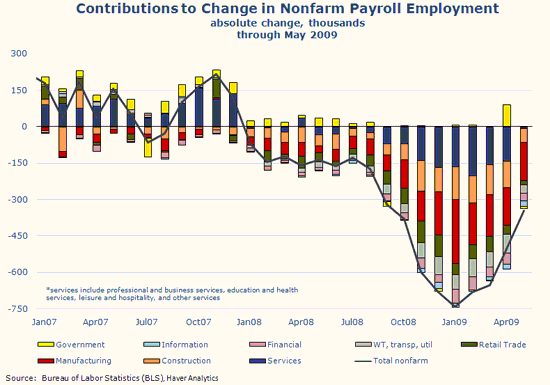 Both analysts point toward the fact that the combination of a decline in May payroll numbers of 345K — the lowest level of decline since September 2008 and about half of the average monthly job losses over the last six months — together with a decline in initial claims that has occurred at the end of the last five recessions, seem to suggest that this development is a positive signal. Atlanta Fed: Historically, declines in initial claims at the end of prior recessions have also been accompanied by declines in continuing claims, which we saw for the first time in the week of May 23, when the number of continuing claims decreased by 15,000 relative to the preceding week. However, Pitts and Shiferaw conclude that time will only tell if these recent positive directions in some of the employment data are really green shoots. SF Fed: We combine data on involuntary part-time workers with the standard unemployment rate to arrive at an alternative measure of labor underutilization. We plot this measure in Figure 3, which shows that the labor market has considerably more slack than the official unemployment rate indicates. 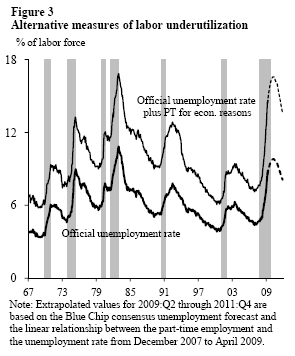 The figure extends this labor underutilization measure using the Blue Chip consensus forecast for the unemployment rate as a benchmark and then adding a share of involuntary part-time workers based on the proportion of workers in that category to the unemployed during the current recession. This projection indicates that the level of labor market slack would be higher by the end of 2009 than experienced at any other time in the post-World War II period, implying a longer and slower recovery path for the unemployment rate. This suggests that, more than in previous recessions, when the economy rebounds, employers will tap into their existing workforces rather than hire new workers. This could substantially slow the recovery of the outflow rate and put upward pressure on future unemployment rates.